UPDATE April 2, 2018 – The Franciscan University of Steubenville, a Catholic college, reported that one of its ads submitted to Facebook containing an image of Christ on the cross was rejected for “shocking, sensational, or excessively violent content.” It is of the San Damiano Cross, a medieval icon-style painting of the Crucifixion. Sylvia runs the website Passion of Christ. She posts content from it on her Facebook page, A Spiritual Journey with Jesus, The Divine Mercy. 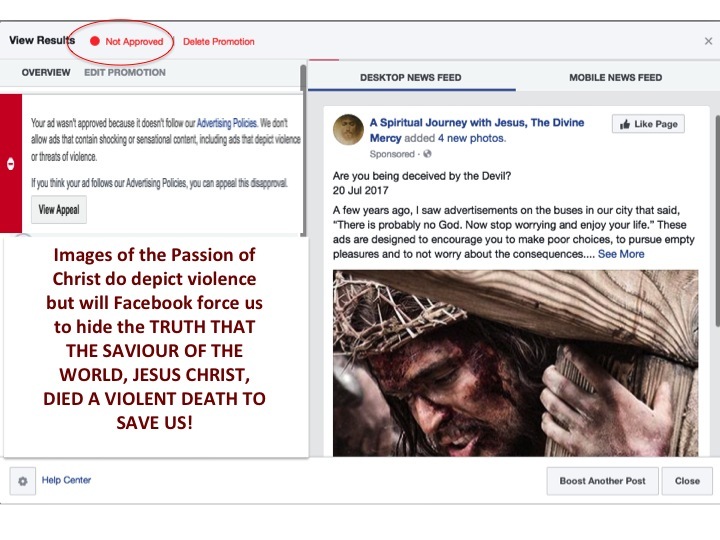 She is promoting a global peace movement on Facebook called “A Peaceful Revolution in the Name of Jesus Christ.” It unites Christians all over the world in prayer and remembrance of the Passion of Christ daily at the time Jesus died for us, 3 p.m. (Each of us in our local time zones.) She buys ads from Facebook to promote her posts. They contain spiritual reflections on the Word of God with related images. Sylvia lamented,”Facebook is calling photos of the Passion of Christ violent, and indeed the crucifixion of Our Lord Jesus was violent. But it is deeply troubling to me that as a Christian advertiser I am being limited in what images I can share.” Pictures of Jesus being crucified have been a fixture in society for two thousand years. They are not glorifying violence. They show reverence for what Christ underwent. There are over two billion Christians in the world, one-third of the population. Christians find these images fundamental to their faith. 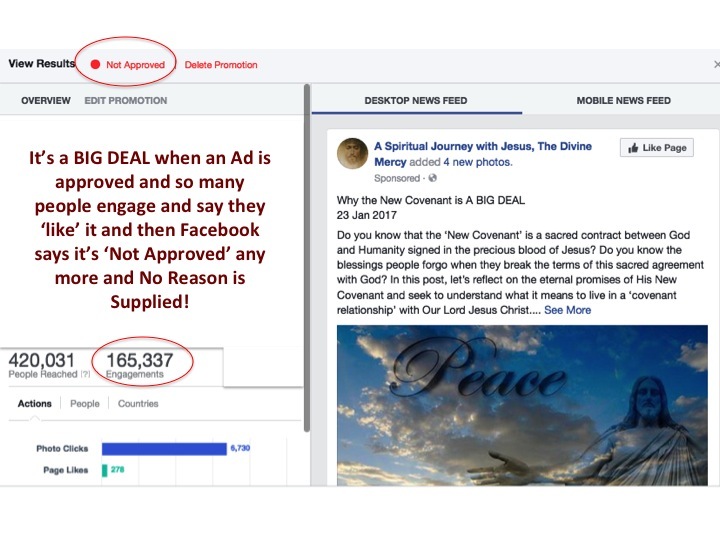 Ads not approved include titles like “Following Jesus,” “Being Christian,” “Are you being deceived by the devil?,” “The Open Door to Heaven,” “Easter – The Victory of Jesus Christ,” and other similar titles. Many of them contain no photos of Christ during the crucifixion. The best guess is Facebook is applying its ban on “shocking, sensational, disrespectful or excessively violent content” to all of Sylvia’s content. One of the ads that was rejected with no reason contains the phrase “signed in the precious blood of Jesus.” It is a stretch to say that phrase fits the list of banned content. A post Sylvia wrote on immortality was approved to run through her Facebook page. It ran one day and then Facebook removed it from her page. Facebook gave no reason. Will Facebook Stop the Censorship? 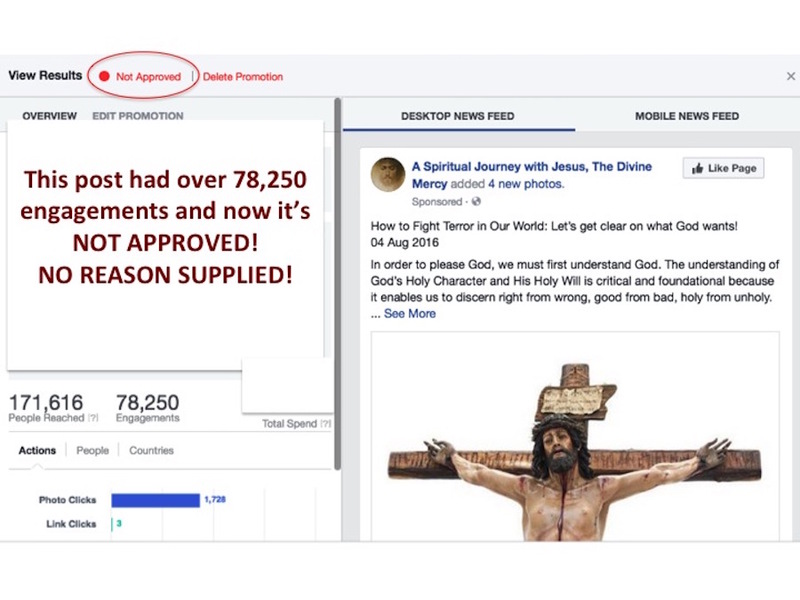 Facebook has come under fire for censoring Christians in the past. It has suspended accounts and posts from users related to Christian issues. Fortunately, after protest, Facebook has reversed many of the suspensions. In this case, the damage is proving to be worse. Facebook has not replied to Sylvia’s objections. People need to get their noses out of their phones and start to live life again. Twitter, Facebook, Instagram, etc are a waste of time. Go outside, read, do anything that needs doing. We have lost almost an entire generation to phone screens and their left-wing, diabolical messages. Thank you. We are to be witnesses for Christ though the living of our lives and interaction with individuals. Not on a phone screen. HandyDan – in addition to following this wonderful blog – please visit me at my website which is my name as it appears here then dot com. I’d also like to get ahold of Rachel Alexander if she can give me a contact address. I’m a journalist too. Thank you. Or…we can continue to use those mediums to witness the Love of God Almighty. When we turn from strife and do nothing evil prevails. That is why things are messed up. Christians always turn and do absolutely nothing. That is unacceptable. These evangelistic tools if you use them for that. So you hit a speed bump. Do you stop and not even attempt to continue to go forward. The world of the internet is bad, I agree, but it is also a tool for taking the message of the cross of Jesus Christ and Him crucified, and what He did for us to the world. Never give in, never stop, never be defeated. Be bold in Jesus’ Name….as mighty as the media may think it is, it is only as mighty as the good allow it to me. Crab it. Speak boldly and don’t back down. Paul sure didn’t, and neither should we. What are we going to DO about it? What IS being done? Anyone know? “Faith comes from hearing the message, and the message is heard through the word about Christ.” Romans 10:17 Let’s continue to promote the Gospel of Our Lord Jesus through every possible medium.